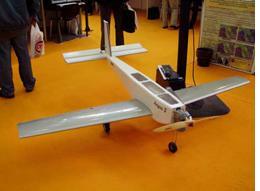 ARGUS S is an unmanned aircraft designed mainly for surveillance purposes, having 200km range of autonomous flight. The take-off and landing phases are remotely radio controlled by human-operated ground equipment, while the cruise flight is entirely based upon on-board intelligent circuitry. Its mission includes environment pollution factors analysis, aerial photography, road traffic surveillance and reconnaissance.